Congratulations to Vincent Porter, pictured here accepting the 2014 Edmund Pillsbury Memorial Cup from Inland Lake Yachting Association Commodore Peter A. Friend at the March ILYA Board Meeting. The Cup, established in 1952 by Mr. and Mrs. John S. Pillsbury and their family, recognizes the outstanding skipper at each summer’s Inland Lake Sailing Association Annual Regatta. In 2014 last August at Oshkosh, Vincent Porter was certainly outstanding as he took first overall in two classes: in Class A, sailing Ryan Fitzgerald’s Eagle; and in Class E, in a down-to-the-wire win in his Wide Open, to tie in points with his uncle Brian Porter, runnerup in Full Throttle. 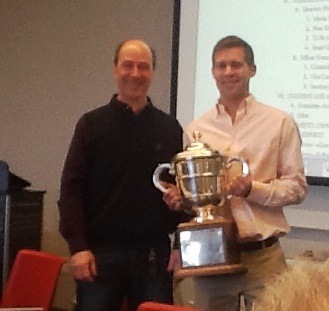 Vincent also won the Pillsbury Cup in 2012 (Class E), and he shared the award in 1998 (Class X) with his father John (Class A) and Brian (Class E). Lake Geneva skippers received the first three Pillsbury Cups (1952, 1953, 1954), and Vincent’s 2014 selection marks the 18th time LGYC skippers have been so honored by the ILYA. LGYC recipients: 1952, William H. Freytag Jr., Class C; 1953, Jane Wiswell, Class C; 1954, Jim Lund, Class D; 1956, Buddy Melges, Class E; 1957, Harry Melges Sr., Class A; 1965, Buddy Melges, Class E; 1974, Henry Bossett, Class M; 1984, John Porter, Class A; 1985, Harry Melges III, Classes E and C; 1986, Harry Melges III, Class E; 1988, Harry Melges III, Classes E and C; 1990, Jane Pegel, Class M; 1991, Brian Porter, Class E; 1996, Iggy Labanauskas, Classes IOD and X; 1998, John, Brian, Vincent Porter, Classes A, E, X; 2010, Buddy Melges, Class A; 2012, Vincent Porter, Class E; 2014, Vincent Porter, Classes A and E.